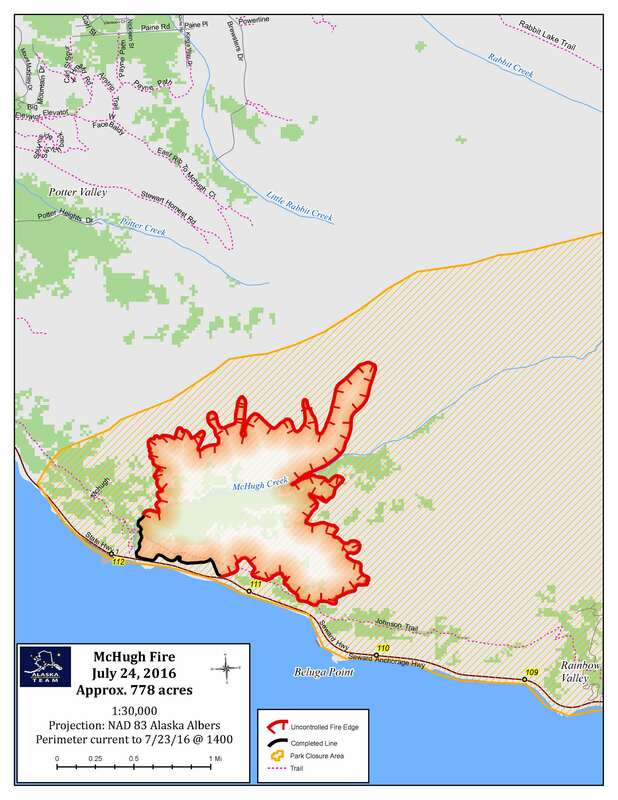 ANCHORAGE – The McHugh Fire continues to be confined by firefighting efforts and natural barriers. With better mapping, the fire is now estimated at 778 acres and firefighters have reached 30 percent of their containment goal. Heavy rain today will aid containment and firefighting efforts continue. The fire began July 16 in Chugach State Park, just south of Anchorage. Fire investigators are working in the area. Firefighters took advantage of a break in the rain yesterday to map the fire, continue to reinforce containment lines, and complete structure protection. They are building containment line by accessing the fire’s edge and extinguishing smoldering embers deep in the duff layer. In addition, the fire is also being confined by the steep, rocky terrain where there is little vegetation, footing is treacherous and digging containment line isn’t necessary. For example, the north flank of the fire is surrounded by high rock peaks and talus slopes where the spread of fire is reduced. In areas too steep for fire crews, helicopters have been dropping water to check areas of fire. Motorists should continue to use caution when driving the Seward Highway through the fire area where the speed limit has been reduced to 35 mph. Pullouts in the fire area remain closed. The heavy rain today may loosen rocks and other debris from the cliffs above the highway. Motorists should not stop along the highway within the fire area. In addition, firefighters and support personnel and equipment will be working on the roadway. A Temporary Flight Restriction remains in effect over the fire area. In addition, the use of unmanned aerial vehicles or “drones” is prohibited within the restricted airspace in order to provide a safe environment for firefighting aircraft. The Alaska Interagency Incident Management Team will continue to provide daily fire updates and will provide additional updates as needed, depending upon fire activity.